Ten years after the first Earth Hour in Sydney put climate change in the spotlight, WWF’s movement is set once again to unite millions of people around the globe to shine a light on climate action. Hundreds of iconic landmarks in Central and Eastern Europe will switch off lights for an hour to stand in solidarity with nature and will join the world’s largest demonstration to support actions on climate change. Last year, millions around the world across 178 countries came together to show support for action to protect our amazing planet. This year the world switches off lights for the Earth Hour on Saturday, 25 March at 8.30 pm local time, to show politicians and business leaders we need to change climate change. In the Danube-Carpathian region the focus of Earth Hour is on green energy and sustainable heating, protection of national parks and valuable nature, consumption of environmentally friendly products. In Bulgaria, two major events will mark the Earth Hour celebrations. A night mountain tour on Vitosha Mountain near the capital Sofia will spotlight the need to preserve the pristine beauty of the Bulgarian mountains from logging and illegal construction. The event will link to the case of Pirin National Park which is one of the World Heritage sites in danger that WWF is working to preserve. The Vitosha trip up and down its highest Cherni Vruh peak with head lamps, skis and snowboards will symbolically mark the Earth Hour on the mountain. The other event will take place in front of the National Theater in Sofia. Earth Hour supporters will observe the switch-off of the facades of iconic buildings such as the Office of the President and the Parliament building. Artists will paint with lights spreading the messages of climate change, while performers prepare a spectacular fire show. In Hungary, WWF will raise awareness about energy poverty and sustainable heating mechanisms through public debates, surveys and workshops. Burning fossil fuels, such as coal, oil and natural gas to generate energy has the biggest impact on the atmosphere than any other single human activity. Joint actions with municipalities and citizens will outline the policy challenges in Hungary and will seek environmentally friendly solutions. 100,000 households in Hungary are currently heated by coal, which is especially damaging. In the evening of Earth Hour, 150 of WWF’s partners and friends will be invited for a tour in the Buda hills near Budapest to watch from above as the capital switches off at 8:30pm. 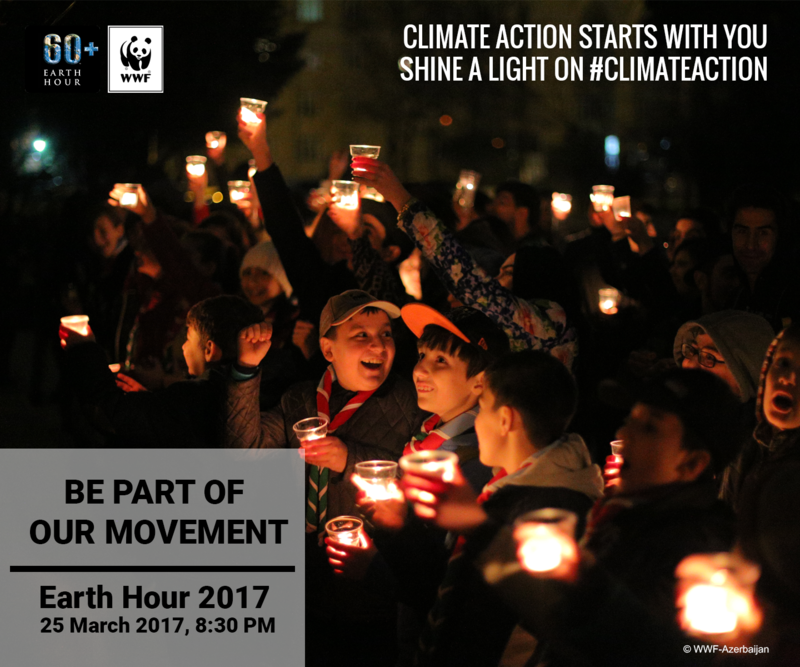 In Romania, the spotlight of Earth Hour 2017 will be on green energy. The message "Give your natural energy" will call for environmentally friendly policies and nature protection. During the day, a public debate will discuss the electricity and environmental issues in the country with a focus on hydropower, green energy, new technologies and innovations. In Bucharest, in partnership with the municipality and local associations, WWF will organize a bike ride on the main city boulevards promoting nature-friendly means of travel. The trip will start in Izvor Park where the participants will enjoy music and dance performances and will watch as the city goes dark. In Slovakia, citizens will have the opportunity to learn how to choose environmentally friendly products in a joint action of WWF and IKEA. Games and quizzes will take place during the day at IKEA’s store in Bratislava. Starting at 6.30pm at the Primatial square workshops will show how to create lanterns from recycled materials, cotton candies will be shaped using energy generated by stationary bikes, and the symbol of Earth Hour will be recreated with candles. The event will be accompanied by a drum show, the music of young performers and a fire show. There will be a special recycling corner for the kids, projection of nature sights on historical buildings, and a bike night ride. The city landmarks will turn off lights at 8.30pm. In Ukraine, the focus of Earth Hour 2017 will be the protection of national parks and valuable nature areas. WWF invites people to learn more about the nature heritage of the country by visiting some of the national parks, nature reserves and other important biodiversity sites in Ukraine. Participants can choose the nearest location and get involved in various activities all day Saturday. The main event will be held in Goloseevsky National Park, where volunteers will plant trees, create nests for birds and participate in a green festival. We believe that our actions today will determine the future for generations to come. The Earth Hour movement recognizes the role of individuals in changing climate change and harnesses the collective power of its millions of supporters to shine a light on climate action. Climate change has different faces or impacts but the time to change climate change is now.